The Sakamaki/Hawley Collection has over 5,000 items, mostly consisting of Ryukyu source materials. The Ryukyu materials (over 2,000 copies/936 items) were collected by the late English journalist Frank Hawley (1906-1961) and it is complemented by the personal collection of former University of Hawaii professor Shunzō Sakamaki. When Frank Hawley died in 1961, Prof. Sakamaki contacted the family and started negotiating the purchase of the collection. Aided by donations from the United Okinawan Association of Hawaii, the University was able to purchase Hawley's Ryukyu collection. The Sakamaki/Hawley Collection contains many materials dating from the 1400s to the 1960s about the Ryukyus and Okinawa. Frank Hawley collected over 2,000 items during his 30 years of living in Japan. The majority of the items are in Japanese, but there are also materials in various European languages, Chinese, and Ryukyuan language (Uchināguchi). The collections are in different formats such as western binding, Japanese traditional binding books, maps, scrolls, wood-block prints, hand written manuscripts, etc. They are now in the rare book cage at the Asia Collection of Hamilton Library and are available for research and exhibitions by advance appointments and arrangements. The Title list of the Sakamaki Shunzō Collection is available at the bottom of the page (in PDF). The title list (PDF) of the Frank Hawley Collection is at the bottom of this page. Frank Hawley was born in 1906 in England and died in 1961 in Kyoto. He's mostly depicted as an English journalist because his last job was as a special correspondent for the British newspaper, The Times from 1946 to 1952. He first came to Japan in 1931. 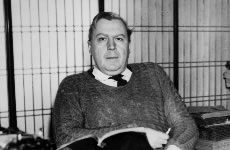 Frank Hawley was also known as an avid book collector. He invested a large amount of his time, money and passion in collecting books, manuscripts, and artworks. It is said that just before the war, he had collected over 16,000 items. Right after World War II began, Hawley was imprisoned and all his collections were confiscated by the Japanese military government. He returned to England in an exchange for overseas Japanese nationals. After the war was over, he tried to get his confiscated collections back, however, only about 70% of the collections were found. He married an Uchinanchu, Hisako Shimabukuro until his death in 1961. He had one son, John, and a daughter, Felicity, with his 2nd wife, Gwynneth Laura Turnbull. Early on Hawley had a strong interest in Ryukyu/Okinawa and started collecting resources. Through Mrs. Shimabukuro, he befriended many notable people from Okinawa and benefited from their help. He invited, for example, Miyanaga Masamori (宮良当壮), a notable Okinawan scholar (linguistics, dialects) to his home almost every week, and together they organized the collection (1949-1952). 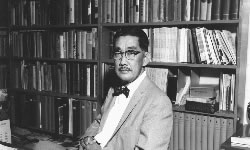 Shunzō Sakamaki (1906-1973) is the “father” of Ryukyuan Studies at UHM. In 1936 he joined the Department of History at UH where he worked as a Professor of Japanese history and he later served as Dean of Summer Session. It was his vision to build a research center on Ryukyuan Studies at UH. Fascinated with the history of Okinawa, he collected books and documents on the subject. While on a trip to Tokyo in 1961, he heard about the death of Frank Hawley who owned the most comprehensive collection on Ryukyuan resources. He quickly made an overture to the Hawley family and successfully negotiated its purchase for $20,000. Funding came from UH and the Okinawan community in Hawaii. Sakamaki donated his private collection to the University Library, and together with the Hawley materials, these resources are known as the Sakamaki-Hawley Collection. To acknowledge his contributions to the University, a building, and a lecture series both bear his name. *Chance Gusukuma, “Nisei Daimyo: The Life of Shunzō Sakamaki,” (Master’s thesis, University of Hawai'i at Mānoa, 1999), pp. 97-102. One of the most important people that brought the Frank Hawley Collection to Hawaii, was Dr. Shunzo Sakamaki. Dr. Sakamaki was a prominent history professor between 1955 and 1971. The University of Hawaii at Manoa’s Sakamaki Hall was named after him. Later on, he was dean of UH Summer Sessions, and that was when he purchased the Hawley Collection. Dr. Sakamaki knew that his objective would be difficult because so many documents and materials were destroyed in Okinawa during World War II. Much of what remained had already been acquired by other institutions or was in private hands like the Hawley Collection. The news of Hawley’s sudden death came on January 11, 1961, while Dr. Sakamaki was in Tokyo and it became a significant moment for Hawaii. He quickly contacted Mrs. Shimabukuro, whom he had never met, with the help of Mr. Ryotoku Higa, Mr. Shuncho Higa, and Mr. Zenchu Nakahara, notable Ryukyu scholars. The negotiations were quite intense because after Hawley’s death was publicized on January 13, many other institutions contacted her, including UCLA and the University of the Ryukyus. However, since Dr. Sakamaki contacted her first, which gave him the advantage. The original asking price was $25,000 and the negotiation deadline was February 20. When he originally went to Japan to purchase some Ryukyu collections, he was only authorized to spend $5,000. He had to look for more funds and persuade the University of Hawaii management to support this expensive purchase in a very short time. After Dr. Sakamaki’s passionate plea, the University approved another $10,000 to purchase the Hawley Collection and he immediately offered the $15,000 to Mrs. Shimabukuro. After more negotiations, a price of $20,000 was agreed upon and the payment was delivered to her on March 9, 1961. The purchase of Frank Hawley's collection was completed. The Hawaii Okinawa community played the key role in raising the additional $5,000 to complete the purchase. Dr. Sakamaki had borrowed $5,000 from the Hawaii Central Bank with a cosigner, Mr. Warren Higa,* who was the President of the United Okinawa Association at that time. They set up the “Okinawa Research Fund” with the UH Foundation and over the next three years, the Hawaii Okinawa community made a substantial effort to help the fund. Holding Okinawa cultural events was one way that the money was raised. Because of this support, the Hawley Collection is with us forever. *Mr. Warren Higa was a brother of Takejiro Higa, who served as a Nisei Military Intelligence Service officer during the WWII. Two brothers' story is available at http://nisei.hawaii.edu/object/io_1149372897278.html.